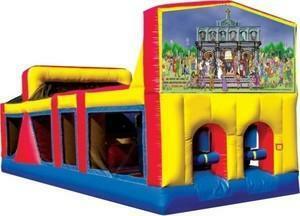 Themed Obstacle Rental, local delivery, set-up, take down, and return. Includes stakes and/or sandbags/water containers for anchoring unit, ground cover and entry/exit mats. Includes 50' lighted electric cord and GFCI cord. Also includes proprietary online safety/supervision training and certification program. Requires two supervisors. 2 children may race go through at one time and go feet first down the slide. Unit requires dedicated 20 amp circuit or unit will not stay inflated. Available in all themes!